Ed Wall has spent his life as a public safety professional – basically a cop who has worn many hats. He began as a police officer in Meriden, Connecticut, a state trooper in New Hampshire and then moved to Wisconsin where his wife Debi was from. He quickly moved up the ladder as a civil service employee in the Wisconsin Division of Criminal Investigation eventually becoming Administrator. Soon after, Governor Jim Doyle appointed him as Administrator of Wisconsin Emergency Management, and he was later appointed Cabinet Secretary of the Wisconsin Department of Corrections by Governor Scott Walker. 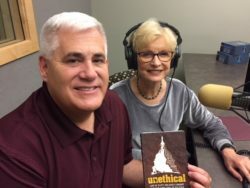 In his newly-released book, UNETHICAL: LIFE IN SCOTT WALKER’S CABINET AND THE DIRTY SIDE OF POLITICS, Ed Wall describes his professional journey which ended in termination from the Wisconsin Department of Justice. At the center of his tenure as Secretary of the Department of Corrections was the Lincoln Hills juvenile detention center investigation – or lack of it. On this program, Ed Wall fast tracks us through his professional life, the realities of working in the political arena, the Lincoln Hills scandal, and the personal despair he suffered and lessons he learned.